There's being stuck at the airport, and there's being stuck at the airport with kids. Catch my drift? I live in Minnesota, halfway across the country from my entire family, who are currently scattered along the east coast. Flying to see them is a requirement. 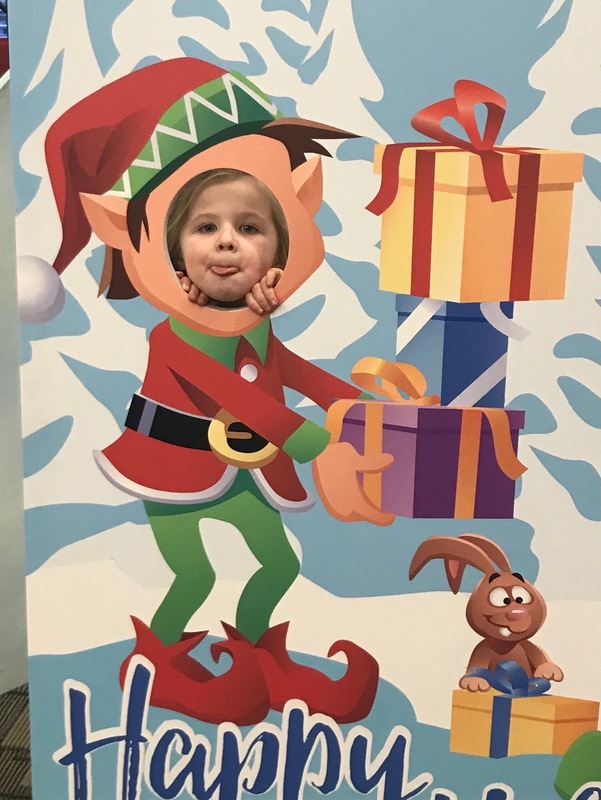 Somewhat last minute, my husband and I decided to take our kids to see their cousins who live in North Carolina. We splurged on non-stop Delta flights, of course, because anything to make traveling with kids easier is worth it, no matter the cost! We get to the airport an hour and a half before our flight leaves. Everyone is excited. The kids are in good spirits. I hate flying, but even I'm excited to get on a plane to see my family BUT... the second-- I'm not exaggerating-- we survived the security line, I received a notification from Delta that our flight was delayed two hours. Collective GROAN. "We'll go to a restaurant for lunch!" we agreed, knowing that delays are simply a part of life and we would get through it. Maybe we could have a fun little outing with the kids, you know, make the most of it? Next thing you know, we are ordering our overpriced airport restaurant lunch... DING!... our flight was delayed another 2 hours. TWO hours. This means that a flight that was supposed to leave at 12:50 was now scheduled to depart at 4:30. Dear Lord! Close to hyperventilating, I told my husband that perhaps it was in our kids' best interest to go home. Keeping them at the airport for four hours, with no real guarantee the flight would even take off, seems cruel and unusual punishment. I tried to get on standby for the 3:30 flight to no avail. 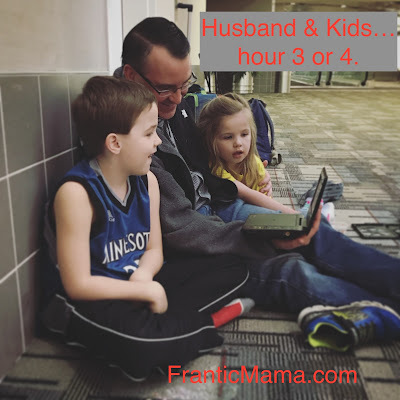 My husband calmly looked out the airport window, acknowledged it was below zero outside, and the kids would be stuck inside at home all day anyway, we might as well spend it at the airport... right? right??? Sure, I guess, I said, surveying the crowd, the shops, the fast food. And my kids, who were now angry and annoyed that they didn't get to see their cousins ASAP. I will spare you the details of how we entertained a 5 and a 7 year old at the airport for the next four hours because IT GETS WORSE: We were given so little information about our 4:30 plane that we called Delta and rebooked the...wait for it... 8:30 p.m. flight. Yes, they still managed a few smiles. But if you tell me "it couldn't be that bad," I will lose it. I still don't know if that was the smart decision or not, but we were scared they would cancel the 4:30 flight (supposedly there was some 'part' being flown in from Detroit... comforting much? ), so we took a gamble and rebooked (and yes had to pay extra). At this point, however, we weren't going to have been stranded at the airport all day with nothing to show for it-- we would make it to North Carolina or BUST! Woo hoo! Good times at the airport. NOT! I'd tell you we had a blast. But no, not at all. We did NOT have a blast. Yes, still there! You'd think we would have been used to disappointment by 8 p.m. that night (and another overpriced airport meal). After all, we had been at the airport since 10:30 a.m.
DING! When we were supposed to board that flight, the gate agent announced that the plane that was to take us to NC? The one we were supposed to be boarding in a few minutes? Yeah, that one was in Omaha, Nebraska. The tears I had held back all day let loose. I looked at my exhausted kids and husband. I decided this was definitely NOT in their best interest anymore. It was time to throw in the towel and get home. At least our cat would be excited to see us. Perhaps we could try to rebook for another weekend. It was my KIDS who insisted they could do it. They could stick it out. They really reallllly wanted to see their cousins: they'd sleep, they promised. They'd be good, they promised. My husband and I looked at each other. Okay, but if it gets delayed one more time, we are heading home. I was so delirious at this point, I can't remember if we said that aloud or whether we had developed a rare, airport-induced ESP. By 9:40 that night, we were finally on a plane, heading southeast. The kids slept the whole time. My husband and I sat there in an exhausted trance. We arrived at 1:30 local time. IN THE MORNING. My mom managed to set an alarm and come get us (thus qualifying for sainthood), and the kids were in bed by about 2:30 A.M. I fell into a bed I found somewhere in her house and woke up many hours later. The point of the whole thing, the takeaway? Well, I must say, the kids were the biggest troopers of the day. I may have thrown in the towel several times that day if it weren't for them hanging in there and being enthusiastic about the trip. Plus, we had a great weekend with their cousins. I suppose it was worth it. Just barely. But worth it. And Thank Goodness, our flight home was uneventful.